Advanced Materials in Japan: Source Book 1992 offers the reader news of all the developments which have taken place over the last year. 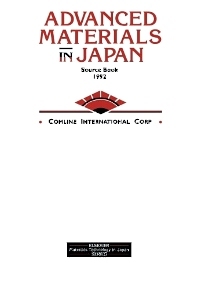 The Source Book is divided into chapters based on the divisions of news in New Materials in Japan – Metals & Alloys; Ceramics; Composites; Electronic & Optoelectronic Materials; Magnetic Materials; Plastics; Materials & The Environment; Medical Materials and Textiles, each introduced by an expert in these particular areas and discussing the implications of the information to non–Japanese industry. In addition, the Source Book includes a chapter devoted to business/market information – company mergers acquisitions etc., together with an overview of the Japanese approach to advanced materials and highlighting all major research initiatives, research programmes etc. Introduction. 2. Metals and alloys. 3. Ceramics. 4. Composites. 5. Electronic materials. 6. Optoelectronic materials. 7. Magnetic materials. 8. Plastics. 9. Textiles. 10. Medical materials. 11. Directory.